AVS Forum | Home Theater Discussions And Reviews > Audio > Speakers > Just purchased a pair of JBL 4722n speakers. I have nothing against the M2, I really like it, it was one of the speakers I was considering duplicating but in the end I went with something else. BTW, the actual M2 cabinet is constructed of 1 inch MDF and braced well of course, it contains two flared ports and is stuffed, just like any other well made cabinet. Small errors in DYI construction when replicating a cabinet like that will probably show when measured but will be overcome by actual speaker-room interaction imho. Don't mention F1, the Mercedes team has been dominating the last two seasons and after the first test this winter it looks like it will be Mercedes in front again, although Ferrari looks ok.
My point is that you can never duplicate the real thing (I agree with you) but you can get close to it. And the cabinet, even JBL had to save somewhere with the M2 and it might very well be the cab design, a skilled DYIer can probably exceed that cabinet construction if desired. Except to me the 4593 based 212 sounds light years better than the mid-line based 8 series. So what was your point again? Point as you know is Tom Danley was able to take the mid line CD's and use them with other drivers to create the synergy horn design. Just like Coach and Frolich (liking the 4722 over the 212's) there are those that like the Danley's over the 212's which have more expensive or flagship BMS CD's. @beastaudio should really chime in as he owns Danleys and prefers them to JTR's. JTR 215RTx3, Digital Amp Co. 60V Golden Cherry Maraschino Monoblocksx3, FTW21" 17cu ft Subwoofersx2, SI18HTx4, Crest Pro Light 7.5 Subwoofer Amplifiersx2, Denon 4520, Oppo103D, Sony40es Projector, Mini DSP NanoAVR-HD, Mini DSP Open DRC-AN, Mac Mini. It looks great but the guy really needs to post some measurements .. without them it's hard to say it's a real M2 clone...performance wise. Your obviously don't understand speaker design enough to understand what I am talking about. Simple question: how come the market is not flooded with M2 like performing speakers if it's so easy ? No problems chiming in at all. I will repeat what I have said from the very beginning about JTR vs. other speakers comparable that I have heard. I can understand why so many love JTR. They are one of the very best and well made ID speakers you could ever ask for. Jeff's attention to detail and crossover work can be accounted as some of the best in the industry. With that said, there is just something that I don't really dig about their overall "Sound." I want to hear these new 2015 versions with the improved midbass, but all else I have heard before (T8, T12 of which I owned, 212, 215rt) that has left me kinda "Meh." The JTR line has a VERY strong "edge" to their sound, and I feel that sometimes the top end just seems to dominate the bottom. Some people immediately fall in love with this, but others don't. It has been my impression at more than one g2g in more than one room that the JTR owners, as well as non owners who previously have heard JTR offerings and liked them, STAY liking them, while others have tended to gravitate towards other offerings in the room. This is what has also happened to me. Every time we have had JTR's hooked up, I have really enjoyed what I was hearing, but then a Danley has taken the stage again and I just melt all over again for their sound. Same with the m2, which is what scares me. In dead honestly I didn't like the presentation of the m2's in asim's room last year, but it was untreated, and the M2's were just kinda plopped in place and considered good to go. A little more work and I believe I would have liked them just as much as I did in Rilla's room the previous time (and that was in MONO!!!). At that g2g, I felt like the m2's improved over the 215's in every category other than the bass of the 215, which the single 15 in the m2 just couldn't quite muster. I should note this as to be expected, and should be a great compliment to the 215 to be able to hang in there in many cases, for a fraction of the cost. Now those including you Mr. Powell, that have the unquestionable "what if?" Don't have it. Get rid of it until you are somehow able to listen to a JTR in your own space. Let's remember your 4722's are from the same company as the m2. While extensive testing and new design patents and concepts are used on the m2, their testing and overall objective remain the same. Is this comment directed at me? Again, I think the M2 is a phenomenal speaker but it's not perfect, no speaker is. I'm sure you know this. The key to the M2's success is it's fantastic waveguide and a great CD, the woofer's directivity control around the xover and its low power compression plus well controlled breakups, DSP as well. The cabinet is well made but it doesn't contribute to the M2s success as much as you allude to imo. .... With that said, there is just something that I don't really dig about their overall "Sound." I want to hear these new 2015 versions with the improved midbass, but all else I have heard before (T8, T12 of which I owned, 212, 215rt) that has left me kinda "Meh." The JTR line has a VERY strong "edge" to their sound, and I feel that sometimes the top end just seems to dominate the bottom. For me, that is why I ultimately sold the 212s, They sound fantastic overall but were "edgy" on certain material. Over time this started to bother me. As they say, once you see or hear something, you can't unhear/unsee it. Suddenly I stopped listening to the speakers and would look for their "flaws" or that edgy sound. I've said this multiple times before but I feel it is true. When you get used to something, you often gain a preference for it, as it is normal. If you grew up with your mom/dad making lasagna a certain way, that is often the way you like it and all others just don't taste the same or good enough. With any of the good speakers being discussed here, once you get used to them, they will likely become your preference. I got used to the 212 (by the way, I DSPd the top end down just slightly so never felt they were edgy) and that became my preference. But if you gave me Danley SH50s or JBL 4722s or JBL M2s or Seaton Cat12Cs, I'd be a happy man. They aren't the same speaker but every one of them sounds sweet in its own way. I could become accustomed to any of them and have that become my preference. Frohlich and jlpowell84 like this. While I agree, it was well before Danleys were in the picture when I started to form my opinions on the JTR line, as well as many other top notch speakers. I essentially NO experience in HT speakers when I jumped in a bought my T12's. Those replaced some Swan Diva floorstanders which replaced some ascend 240SE's. Neither of those are even in the same league obviously, but I still felt something was missing with the T12. Hoping the 212 would maybe fix it, I was stoked to hear it, but came to the same conclusion. While definitely a much better speaker and presentation than the t12 I had previously, there were still other speakers in the room that day that I preferred, one being the Catalyst. I felt that it was superior (albeit only slightly) to the 212 in every way. It wasn't until I got the sm60f's up to philly that I think Danley started getting back on the radar for some folks, including myself. I was already hooked, but hadn't even had enough time to "Get used to them" so much. Once again, I totally agree that you get accustomed to the sound, but I have/had been accustomed to many different sound through each of my demo's of JTR and my opinion remained pretty steadfast. The "clones" on the Lansing Heritage website would be difficult for someone to market. All the critical components (waveguide, 2216Nd driver, and the CD) are sourced through authorized JBL service centers. If the numbers hit a trip threshold JBL will make the parts unavailable without a serial number. They have shut down the sale of waveguides on at least one occasion. If someone were to make a 3d printed copy of the waveguide you bet the Harmon lawyers would be on full attack mode (and rightfully so, the theft of intellectual property costs US businesses billions of dollars per year and DoD has been hit particularly hard). Simply because not enough people care to copy it. The DIY is a niche group and those interested in copying the M2 are even smaller. The M2 is obviously an amazing speaker but it is not immune to being reverse engineered and copied. You might have misunderstood me. If it was so easy to achieve as you suggest, how come the market is not flooded with M2 like competitors. I did not only mean the question about DIY, I meant in total, including all MFG made and retail and ID speakers too. There is a total lack of that in the market because contrary to what you think, it's really hard to do. It's difficult even for advanced speaker designers, and well established speaker manufacturers. That speaks volumes to what I am suggesting. It's not the cabinet, it's the total package. I can't say that any more clear. The cabinet is just a small piece, but if you think creating a total design that lacks the resonances of the M2 is easy... you should build me my next cabs. And no it was not directed at you. My question was more: "how come the market is not flooded with JBL M2 caliber products, and competitor offerings"
I think people gravitated towards the DIY side of things, but I was speaking in general. I chuckle at the idea a DIY would add up to M2 level performance, even with a decade of trying it would be hard for a very intelligent speaker DIYER to hit that target. I'm not sure people understand what it really is, and does, and why it is special. The only shot at even getting close is to copy it, using their own parts, because as you say there is patents involved too. I think I said 50 times I would never buy an M2 because it's not in my budget, but I think sometimes people like to beat it up because of that too. It does not get the respect it really deserves on this forum IMO. In professional circles and communities it does, but those people are generally better informed I think. I guess that makes sense in a consumer oriented/dominated forum where most of the people are not going to spend that kind of money on a pair of speakers, or tolerate that size, big noisy amp in another room, and the other not so consumer friendly things about them. The M2 design is more than just a generation ahead of the market, or DIYgroup like options. I look at stuff like the Fusion 15 or the Pi, or the Geddes stuff, which is all excellent in it's own right but certainly not M2 level tech. I'm not sure why people seem to think it's so easy to hit that same performance target, if that was true there would be many more doing it. The idea the ID companies could hit that target if they wanted is utterly comical to me. They probably could not collectively, if you grouped all the ID company talent, and research and development funding and resources for an entire year together as a whole toward that one goal, and certainly not inside 12 months from start to market availability. There is so many obstacles to overcome to get there it would take an entire thread to discuss them all. I view JBL Professional as a giant candy store for adults (at least adults who like websites like AVS). JBL Pro makes so much of the information available to the public, the technical manuals for passive speakers contain the schematics for the crossover networks - although they do seem to be error prone. I am particularly excited about the newest approach. If you look at the VTX M20 or M22 monitors that were just released (http://www.jblpro.com/www/products/t...0#.VtCuAI-cGUk) , they have internal passive XO's for the HPF/LPF and that's it. All other processing is done via DSP in the amp. The cool thing is that by having the passive XO only 1 amp channel is required per speaker, effectively cutting the overall cost in half. In addition, these monitors have the latest M2-derived waveguide. They are calling it "image control waveguide technology." Once the technical manuals are available, the exploded view will show the part number for the new waveguide and a quick call to a JBL pro parts service center will result in one being shipped to the door. I assume this is the tip of what's coming. Can't wait to see how the D2 CD's measure on the 4722 horn. If that horn wasn't so dam wide I would be looking into making a set. The waveguide from the VTXF15 and STX825 (JBL Pro Part Number 5006815) is also new, it is seems to be just prior to the M2 technology fusion though. But it runs less than $50 and is pretty special from whit I've read on it. Let JBL do the heavy lifting! Mfusick and jlpowell84 like this. I understand what fine point you are trying to convey and tend to agree on that side. The more I learn about speakers/sound/speaker design/etc I see it's ALL ABOUT TRADE OFFS. It's like deciding what areas you will lack on to make a decent overall speaker. Kinda like if you took a stock 2016 4x4 truck (choose your brand) and you had only 6-7k to TOTALLY pimp it out for off road use. You will need suspension lift, maybe body lift, maybe shocks, skid plates, etc. Not to mention if you wanted to bolt on some cold air intake, aftermarket exhaust, computer tuner for ECU. Then you have the body if you want to make any personal preference changes like different headlights or some off road LED light bars. You see where I am going and you just can't do everything you absolutely want on 6 grand. I have come to understand speaker design like that, choosing certain points to make good disallow all points to be perfect. Or else we would see all perfect speakers. Contrary to what you might think, the "market", as a whole, may not be as enthralled with the M2 as you are. There are posts where some are enamored by the M2 and others that were just *meh*. Not everyone wants a speaker that requires a proprietary amplifier and DSP to operate, myself included. I don't want expensive, proprietary electronics to be required for the life of my speakers. I prefer the neutrality of a speaker being a passive device that has the ability to do active w/DSP as an option, not a hard requirement. When I find something I like, I keep it a long time. Products have life cycles and will eventually go end-of-life status. 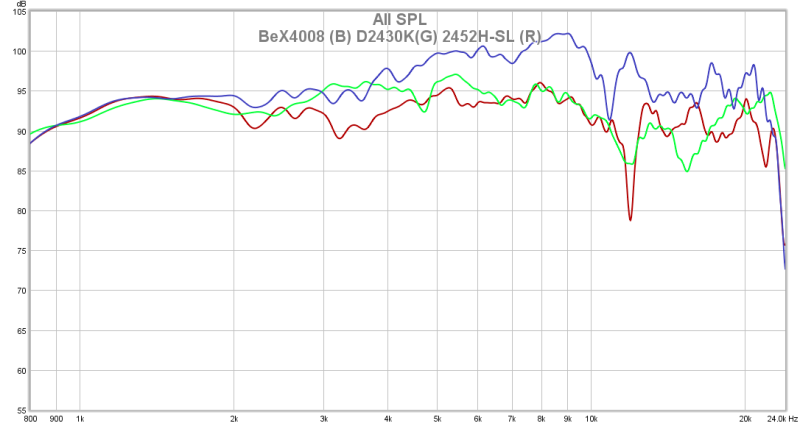 Electronics have a lot higher propensity to fail versus speaker components. This should be a consideration when ordering M2. Finding parts for my JBL XPL 200 can be difficult now, so that day will come. Active speakers are not for everyone just as the market has shown. Think about it. What is the going rate for a set of M2s? $15k a pair street price? Plenty of members on the forums who spend that and much more on speakers yet how many own the M2? The same can be said over on the audiophile forums. I have a pair of JBL XPL 140's I need to put up for sale. Cool speaker and sounds great! Rebuilt woofers too! So to be clear you are suggesting that the lack of market options that are equal in performance of an M2 is because the companies that make speakers and the people that buy them don't want an active speaker/amp combo so no one else bothers to make or sell a competitive offering ? Yeah, it looks great on paper but I heard it at CEDIA an I was very underwhelmed. It was okay at best. If I wanted a single 15" JBL type speaker, I'd build a Pi4 for a few hundred bucks. Sorry to jump in but there was a lot of talk about JTR and BMS. Part of me thinks the BMS 4593 that was in the older JTR Noesis speakers would still be the one CD I may love. The original Noesis 212 (2013) was very flat and therefore sounded a little harsh to some. The new versions sound more laid back. The high frequency device in the BMS coaxial compression is very similar to their regular compression drivers. The difference is the addition of the mid range that is concentric and time aligned. The horn loaded midrange is the big difference. Tom has an ingenious design loading multiple drivers into a single horn that makes it act as a single point source. The BMS coaxial compression drivers also give this same results. Hopefully, there will be some more G2Gs so people can hear different speakers side by side. There is one in PA, March 20th. The +2015 don’t have that “edgy” sound and offer a wider sound stage because to the better off axis response due to the new phrase plug. With any of the good speakers being discussed here, once you get used to them, they will likely become your preference. I got used to the 212 (by the way, I DSPd the top end down just slightly so never felt they were edgy) and that became my preference.. This is actually a great example of what people think they want vs what they really want. The original Noesis 212 had a very flat response however people seem to prefer the more laid back sound of the newer ones. A couple db here or there can make a big difference. Now with processors having parametric eq and user adjustable Dirac people easily can tailor their system to their liking. No need to apologize to me. I'm honestly not bothered by your comments in the least. It's your opinion and it's different than mine. It's all good. Scott Simonian, Frohlich, dgage and 2 others like this. Well, that was a refreshing response. Frohlich, dgage, Gooddoc and 2 others like this. See boys we can play nicely! But for real though perhaps Scott's ears have a frequency response and tonal characteristics that make the M2 not sound THE BEST EVER! You could have three speakers all +-1db from 40hz-24,000hz and all have excellent bass decay in the time domain/waterfall graph (probably the single biggest overlooked point in going for good sound?) and two dozen people would choose different speakers based on tonal characteristics I am guessing. Why does David like his 1st gen JTR 212 Noesis over the JBL 4722? And then Coach and Frolich like the 4722 over that exact speaker? I am speaking to the upper end of the CD more so than mid bass (jab in ribs David) and the fine nuances that different ears hear and like better. 1. Tom has an ingenious design loading multiple drivers into a single horn that makes it act as a single point source. The BMS coaxial compression drivers also give this same results. 2. Hopefully, there will be some more G2Gs so people can hear different speakers side by side. There is one in PA, March 20th. Most certainly legacy gems from the JBL lineup. I read somewhere they were Greg Timber's favorite design. I kinda want to keep the pair especially after the woofers were rebuilt at Orange County Speaker. They did a superb job and when I had two Seaton Submersives playing only 3db hot I could not tell the difference from subs on and speakers crossed at 80hz vs subs off and running full range. They really are special with music in their 3 way design. But I suspect the two upper range drivers would need rebuilt or something. I am not sure if HF drivers can be rebuilt but I thought I heard some distortion at one time from them when used as temporary surrounds. There is no need to beat a dead horse. You have made a name for yourself in thread after thread putting down numerous speakers other than the M2 and LSR 305/308. I have been a JBL fan for nearly 30 years. However, there are other fabulous speakers in the world. You are very well versed in speaker theory and design. It is your passion, and I applaud your due diligence in studying the books and white papers of Toole and others. Your right, I probably don't know the in and outs of the M2 design. To be honest, I don't care enough to know. I spent countless hours learning the crafts of my trade, which I also immensely enjoy, i.e Cisco, Juniper, Palo Alto, VMWare, etc because that is what has provided a very comfortable life for my family. I hope you are able to translate your knowledge and passion into revenue streams. You obviously have the aptitude and passion. You should pursue an engineering degree and try to land a position at Harmon . I am not being sarcastic, I think you could do well in the field. COACH2369 and Molon_Labe like this. d2430k hooked up. Without any EQ, 2452H-SL measure the best. 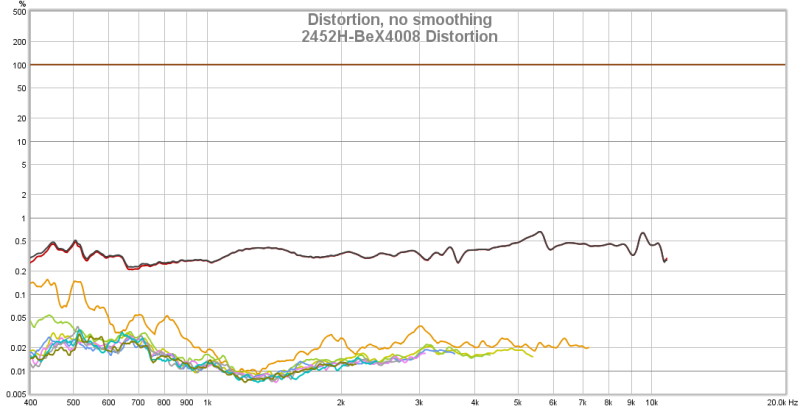 Distortion and ringing compared to the BeX driver is very similar. They're both excellent performers. EQing system now then will do some listening tests and more measurements. I know it is difficult to design a speaker "for the people" when people may not know what they want and different people like different things. I for one prefer the aluminum horn as compared to your newer horn. If I had never heard the previous gen 212, I'd probably like the current gen 212 more. Still a great speaker where we're nitpicking differences. These D2430K aren't going to work as well crossing this low. Oh well. LTD02, Frohlich and hypez604 like this. 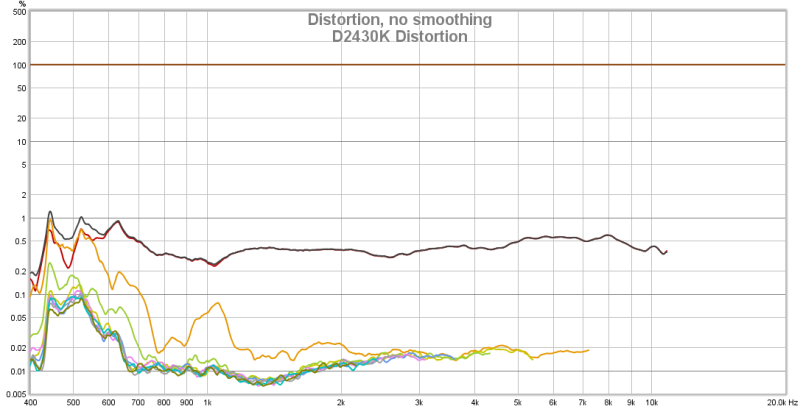 After some listening, the D2430K is less detailed than the 2452H-SL with BeX4008. Wife confirms. I'm going to get a pair of 2453H-SL and see how they compare next. So far, favorite is the 2452H with the BeX4008. The Aquaplas Ti diaphragms in a very close second. LTD02, Frohlich and dgage like this. Where in PA is the G2G on March 20th? Is it the 2452H with the BeX4008 or the 2452H SL. I thought the 2452h had a fixed diaphragm you can't replace so you needed to buy the "SL" version to replace diaphragms. I believe it is in Pittsburgh. I only know this because I recently sold "raynist" some speakers and he mentioned they are having one in March. Last edited by Frohlich; 02-27-2016 at 04:53 AM.